Welcome to the New Year. 2013 will provide both exciting opportunities and challenges. Arizona Public Media’s primary objective remains unchanged: to serve audiences with distinctive, thought-provoking content on-air, online, and on-the-ground through educational community outreach activities. Downton Abbey, the Emmy® Award winning Masterpiece Classic series, reigns as one of the most popular drama series on television world-wide. The much- anticipated Season Three premieres on Sunday, January 6th at 8 p.m. on PBS 6, and continues through February 17th. The all-star cast returns with a special guest, Academy Award®-winner Shirley MacLaine. Tune in for another thrilling season of one of the great melodramas of the modern television age. In December, we hosted a special Downton Abbey member event featuring an exclusive lecture given by UA’s Dr. Jerrold D. Hogle, Ph.D., at Crowder Hall. The evening featured a special screening of episode one of Series Three. Watch a recap of Seasons One and Two here and a trailer of Season Three here. This month Arizona Public Media celebrates the 2nd anniversary of Arizona Week, our weekly Friday night public affairs program. The series recently reached a milestone, airing its 100th episode in December. Since the show’s inception in 2010, more than 326 journalists, scholars, and politicians have joined host Michael Chihak in bringing depth and perspective, both on-air and online, to the top state-wide issues of the week. The program airs on Fridays at 8:30 p.m. and repeats on Sunday mornings at 10:30 a.m. It also airs in Phoenix on KAET Eight World on Fridays at 7:30 p.m. The 100th episode saluted the anniversary of Pearl Harbor with the stories of three World War II veterans and Arizona’s plan to create a World War II memorial on the Capitol Mall in Phoenix. Watch the 100th episode here. Sundays continues to be a great night for drama. Preceding Downton Abbey on Sundays at 7 p.m. is the premiere of the long-running BBC series Born & Bred. Set in the Lancashire village of Ormston in the 1950’s, this popular drama series centers on the relationship between city doctor Tom Gilder and his village General Practitioner father, Arthur Gilder. Antiques Roadshow continues each Monday night at 8 p.m. with brand new shows from Corpus Christi and Boston followed by a new season of Market Warriors at 9 p.m. This season, Market Warriors features a new ‘picker,’ Bene Raia. The group continues their antiquing adventures, scouring flea markets across the country including Walnut, Indiana; Long Beach, California; Chantilly, Virginia; and Liberty, North Carolina. On Tuesdays, American Experience presents “The Abolitionists,” a three-part program on January 8th, 15th and 22nd at 9 p.m. Vividly bringing to life the epic struggles of the men and women who fought to end slavery, “The Abolitionists” tells the intertwined stories of Frederick Douglass, William Lloyd Garrison, Angelina Grimké, Harriet Beecher Stowe and John Brown. Watch a preview here. Later this month, American Experience premieres a four-part series called Titans starting January 29th at 9 p.m. with “Henry Ford,” a fascinating portrait of a farm boy who rose from obscurity to become the most influential American innovator of the 20th century. Included in the Titans series is “Andrew Carnegie,” “John D. Rockefeller,” and a new program, “Silicon Valley,” an absorbing look at the early mavericks of Silicon Valley. Exploration Wednesdays resumes on January 2nd with a brand new six-part series, Life on Fire at 10 p.m. narrated by Jeremy Irons, which presents an in-depth look at the difficulties surrounding life around volcanoes. The first episode, “Icelandic Volcanoes,” reveals the country’s molten mountains as ticking time bombs which, when they blow, could have global consequences. The series continues throughout the month with “Volcano Doctors,” on the 9th, “The Surprise Salmon” on the 16th and “Phoenix Temple” on the 23rd. In honor of Sir David Attenborough’s 60th anniversary on television, NATURE presents Attenborough’s Life Stories, a special three-part series starting on January 23rd at 8 p.m. The first episode, “Life on Camera,” revisits key places and events in Attenborough’s wildlife filmmaking career. Doc Martin, the popular comedy-drama on Thursdays at 9 p.m. continues in January with Season Five. To add a bit more British drama/comedy to the night, PBS 6 debuts Death in Paradise at 8 p.m., an 8-part series about a detective inspector who is assigned to investigate a murder on the paradise island of Saint-Marie in the Caribbean - despite his hatred of sun, sea, and sand. The popular Hollywood at Home film series continues at 9 p.m. on Saturday nights. This month’s features include “Top Hat” on January 5th, “Bedazzled,” January 12th, “No Way Out” on the 19th, and “Platoon” on the 26th. Starting Wednesday evenings January 2nd at 8 p.m., Classical 90.5 presents Center Stage from Wolftrap, with hosts Rich Kleinfeldt and Bill McLaughlin. This 13-week, one-hour series showcases live performances from some of today’s finest chamber musicians. Happy New Year! On behalf of all of us at AZPM, thank you for your viewership, listenership and continued support. Norman Lebrecht has devoted his career to being indignant and wrong about many things in classical music, but I think he's right to make periodic attempts to swat Mozart down from the pedestal upon which he has been placed, as some sort of god whose music can create baby geniuses in the womb, elevate the character of the darkest fiend, and raise the dead from their graves (well, maybe that last claim hasn't been made--yet). Surely Lebrecht is a bit extreme in his support of "the Pierre Boulez slogan that Mozart was a regressive force who added nothing to the development of music. The inventors and energisers in music history were Bach, Haydn, Beethoven, Wagner, Mahler and Schoenberg; all else was entertainment." Still, it's good to be admonished from time to time that we should not be genuflecting before Mozart, as has become especially common among people who tend not to be deeply familiar with much other classical music that's out there. Read Lebrecht's latest screed, and if you're incensed, I think Lebrecth will consider it a good day's work. The Minnesota Orchestra musicians are in lockout as contract negotiations have stalled; the issue that's getting the most press is that the musicians want a raise, but management says it can't afford it, considering the current deficit--a deficit that has only recently been admitted after the board spent the past few years doing some questionable accounting to hide earlier budget shortfalls. A recent article in the Minneapolis Star Tribune attempts to see if management could really afford to increase salaries, given the size of the orchestra's endowments and the success of its ongoing capital campaign, but what it doesn't make completely clear is that such moneys have almost nothing to do with paying the day-to-day bills--in Minnesota, in Tucson, or anywhere. Let's start with capital campaigns. Just because an organization has undertaken a special project to bring in a huge amount of money in a short time doesn't mean that all that money can actually be spent. First, What counts as "raised" funds includes pledges--promises to pay a certain total over a certain number of years. A $1 million pledge can be merely theoretical money in the bank until every installment check has been cashed, and those can be spread out over two, three, 10 years. And What is the campaign raising money for? If it's general operating funds, fine--spend, spend, spend! But such campaigns are rare, because major donors aren't really interested in giving money that will evaporate within a year, unless they're underwriting a specific program or position. If it's a campaign to raise money specifically for a new building or wing, that can't be poured into the pot from which salaries are poured. The budget for constructing and maintaining a building is completely separate from the budget for everything else, and besides, the donors have been told they'd be giving money toward a building (possibly with their names being appended to parts of it); diverting their donations to another use is dishonest, and could lead them to try to rescind their donations. What about endowment campaigns, and the endowments themselves? Millions of dollars can be sitting there on the balance sheets, untouched, seemingly begging to be spent. But usually, they can't be--or at least shouldn't be. There's a big difference between a cash reserve and an endowment. A cash reserve is like your checking account: Spend it as you need it, and replenish it regularly by earning money one way or another. An endowment is a pot of money invested with the strategy of producing a certain return each year; in effect, you can spend the return on the investment, but you don't touch the investment itself. It's like putting $100 into a savings account and allowing yourself to spend whatever paltry interest you earn on that $100, but never withdrawing any part of that base sum of $100. Many endowments are set up so that it's quite simply illegal to transfer the endowment's capital investment to the general operating funds; others are not, but it's usually a sign of trouble when an organization starts slicing away at the meat of the endowment in order to make up its budget deficits. So if orchestra musicians or museum acquisition officers eye the endowment as an immediate source of money to increase salaries or programs, they need to blink a few times and refocus on the return on that investment. And as the past few years have shown, that can be too volatile a number on which to base a long-term financial plan. If all this is fairly new to you but you'd like to get wonky on the subject, here's a good introduction to all the issues relating to endowment management for nonprofit organizations. Throughout the year our members, listeners, viewers, and volunteers frequently express how exceptional they find our programming. What better way to share this enriching experience with family and friends than by giving the gift of an annual AZPM membership for the holidays. Your support makes it possible for AZPM to acquire and produce the broadcast and educational services that enrich our lives and strengthen Southern Arizona communities. You can also support AZPM by making a year-end donation or an IRA Charitable Rollover. For more information on giving please visit azpm.org/support. AZPM staffers were recognized with eight Rocky Mountain Emmy® Awards – more than any other Tucson TV station. Original documentary productions included Together We Heal, Arizona’s Dust Bowl: Lessons Lost, and Seeking Water from the Sun. Original radio documentary productions included The Five Cs: A Century Later, Collecting Light: An Exploration of Arizona Astronomy, and Beyond the Sprawl – Rethinking the Southwestern Economy. Your Vote 2012 provided comprehensive election coverage including 52 “Meet the Candidate” interviews, 12 dedicated Arizona Week episodes, and 20 candidate forums across TV, radio and online. In addition, and for the first time, AZPM produced more than a dozen “Get Out the Vote” spots featuring some familiar faces and some new faces from the community, encouraging audiences to become involved in the electoral process. For the 10th year in a row NPR 89.1 was voted Best Radio Station for News by the readers of Tucson Weekly. 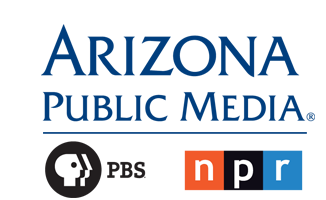 NPR 89.1 remains the top-ranked News/Talk format station in the Tucson radio market. AZPM launched PBS LearningMedia® in collaboration with sister-station KAET8/Phoenix and hosted teacher training events in Southern Arizona. PBS 6 remains among the Top 10 most watched PBS stations nationally. Throughout this month PBS 6’s membership campaign features a number of compelling and entertaining specials. Highlights include “Downton Abbey Revisited” featuring great moments from the series’ first two seasons along with cast interviews, rare behind-the-scenes footage, and a sneak peek at what’s in store for the Crawleys as they enter the Roaring Twenties; an encore broadcast of Season 2 of Downton Abbey starting December 2nd (leading up to the much anticipated premiere of Season 3 on January 6th); “Tommy Emmanuel Center Stage,” and “Fab Four: The Ultimate Beatles Tribute.” A schedule of dates and times are at azpm.org. New holiday specials for December include Great Performances: Rod Stewart: Merry Christmas Baby; Christmas with the Mormon Tabernacle Choir, featuring Jane Seymour and baritone Nathan Gunn; the annual National Christmas Tree Lighting; and the first-ever Cat in the Hat Christmas special, The Cat in the Hat Knows A Lot About Christmas. Perennial holiday program favorites include Rick Steves’ European Christmas and Christmas in Yellowstone. TV schedule listings are here. December’s ‘Chef of the Month’ on ReadyTV is Lidia Bastianich, who will host mouth-watering new episodes of Lidia’s Italy in America. To help celebrate, we are giving our Facebook fans an opportunity to win her new cookbook “Lidia’s Italy in America.” Like us on AZPM Facebook to enter the contest. Visit here for the complete ReadyTV schedule. Classical 90.5’s Community Concerts series will broadcast performances from the 2011 Tucson Winter Chamber Music Festival, recorded here in Southern Arizona. Complete classical program listings are here. And while 2012 has been chocked full of challenges and accomplishments, there are more coming in 2013. Topping our list in late-January is the re-launch of Arizona Illustrated, or as it will be recast, AZ Illustrated. Each weeknight will feature a different host and focus area including Metro on Mondays, Science on Tuesdays, Nature on Wednesdays, Arts on Thursdays, and Friday will remain The Political Roundtable with the Tucson Weekly’s, Jim Nintzel hosting. Stay tuned. On behalf of all of us at AZPM, please accept our very best wishes to you and your family for a happy and healthy holiday season and 2013. As always, thank you for your viewership, listenership and continued support of Arizona Public Media. Americans routinely decry the multi-million-dollar contracts awarded professional athletes, yet remain fixated on pro sports. I wonder if Americans would be more interested in classical music if we threw more money at the leading conductors; at least we'd have something more to complain about. Not that the nation's top-tier music directors are making nearly as much as America's top athletes, but neither are they in any danger of applying for food stamps. The Los Angeles Times has posted an interesting article about how the L.A. Philharmonic's bottom line has risen--coincidentally or not--along with the salary of music director Gustavo Dudamel, who pulled in a bit more than $985,000 in salary and benefits in 2010 (the latest year for which nonprofit tax records are easily available for public inspection). As they say, you've got to spend money to make money, and it seems to be working on Los Angeles. Dudamel is by no means the highest-paid music director in America. The newspaper offers as a sidebar a summary of the compensation for some other high-profile conductors (note the presence of Charles Dutoit at the Philadelphia Orchestra; he makes big bucks, even though he is not filling the position of music director). Of the conductors listed (the table omits several leading figures), the man who's raking in the most dough from a single job is the San Francisco Symphony's Michael Tilson Thomas, who earned $2.41 million, according to the most recent available tax returns. Oddly, the salaries for the music director, executive director, and chief financial officer are not listed in Part VII of the TSO's 2010 Form 990, although they ought to be. Surely they're not working for free? Maybe it is time for them to apply for food stamps. Arizona Public Media just wrapped up the first radio campaign of the fiscal year, on Classical 90.5 and NPR 89.1. The campaign was a resounding success, and featured more than 85 community voices, generated 2,547 calls of support. Our appreciation goes out to all of the new and renewing members of AZPM and to those that pledged an additional gift to help us surpass our ambitious goal. More good radio news includes the results of the summer ratings survey. NPR 89.1 remains the top-ranked News/Talk format station in the competitive Tucson radio market (ranked #7 overall) and Classical 90.5 ranked 15th among listeners age 12+. Last month I mentioned that AZPM received 10 Rocky Mountain Emmy® Award nominations. I am pleased to report that AZPM staffers were recognized with a total of eight awards, more than any television station in the Tucson market. I am delighted to report that one of the eight awards went to UA student and AZPM photographer, Cooper James, the first UA student to receive this prestigious honor for his work as a videographer on the Arizona Illustrated feature story, “The Zoppé Circus.” You can watch all of the 2012 AZPM award-winning productions here.These awards, which are judged by peers in other regions of the country, demonstrate the creativity and quality of AZPM’s content production staff – whose work would not be possible without your continued support. As the election campaigns come to a close, AZPM’s Your Vote 2012 remains your source for in-depth coverage of local, state, congressional, and the presidential races, and up-to-date information on propositions that will affect Southern Arizona. Tune in for live coverage on election night, November 6th on PBS 6, NPR 89.1 and online at azpm.org. AZPM Political Correspondents Christopher Conover and Andrea Kelly, along with Education Reporter Fernanda Echavarri, will be out in the field with live coverage of election results at various campaign headquarters around the community. These local, live updates will be featured during special election coverage from the PBS NewsHour and NPR Election Night live broadcasts beginning at 6 p.m. This month PBS6 will premier "Arizona’s Dust Bowl: Lessons Lost", produced, written, and directed by Tom Kleespie, AZPM’s Sr. Producer, Special Projects. This new AZPM documentary which airs at 7 p.m. on November 18th, immediately prior to the latest Ken Burns program, explores how the 1930’s Dust Bowl affected Arizona‘s culture and economy, and includes interviews with several prominent academia from the University of Arizona. Other PBS 6 November program highlights include Sunday Brit-Drama Night starting at 7 p.m. with the hit BBC series Call the Midwife, MASTERPIECE: Upstairs Downstairs at 8 p.m., and an encore broadcast of MASTERPIECE Classic Downton Abbey – Season 1 at 9 p.m. Tune in on Sunday, November 25th at 8 p.m. for “Downton Abbey Revisited.” Savor great moments from the series’ first two seasons, along with cast interviews and behind the scenes footage. Here’s an inside tip – an encore broadcast of the Season II of Downton Abbey will air starting December 2nd, all leading up to the much-anticipated premiere of Season III on January 6th. Enjoy! Popular science and nature-based program night, Exploration Wednesdays, continues with all new programs starting at 8 p.m. with NOVA, NATURE at 9 p.m. and NOVA scienceNow at 10 p.m. The Hollywood at Home film series on Saturday nights at 9 p.m. continues to gain in popularity with our audiences. This month’s film features include “The Searchers,” “The Hound of the Baskervilles,” “Rocky II,” and a pre-Thanksgiving film marathon, Wednesday, Nov. 21st with “A Walk in the Clouds” and encore broadcast of “Rocky II” starting at 8 p.m. On Thursdays, join PBS 6 for one of the most popular series from the BBC, Doc Martin, starring Martin Clunes. For complete television listings visit azpm.org/schedules. As Thanksgiving Day approaches, I want to thank you for your viewership, listenership and continued support of Arizona Public Media.